Applications Manager monitors performance and availability of application servers (JBoss, WebSphere, WebLogic, Tomcat, Microsoft .NET), databases (MySQL, SQL Server,Oracle, DB2), web sites, systems, and network services and notifies problems.It is a simple and easily navigable software for IT Administrators and Operators managing an Internet Data Center or the IT infrastructure of an enterprise. It provides fault management and notification capabilities. Version 13.0 is a freeware program which does not have restrictions and it's free so it doesn't cost anything. For security reasons, you should also check out the ManageEngine Applications Manager download at LO4D.com which includes virus and malware tests. Additional screenshots of this application download may be available, too. 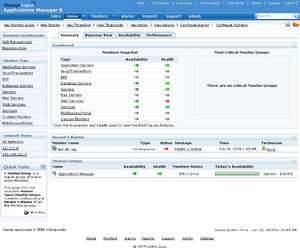 ManageEngine Applications Manager download been highly rated by our users.